SWBAT create graphs to share the results from an experiment by selecting appropriate intervals, including title and headings for each axis, and including a key. After conducting an experimenting in the previous lesson, students illustrate the data they collected in a graph to share with others. 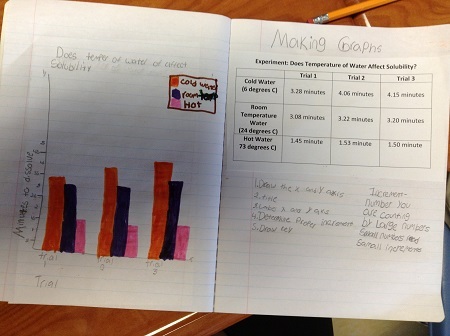 Although graphing is not a science standard, it is an important scientific skill. It requires students to analyze data recorded and illustrate it in a way that is easy for others to understand. Experimentation is something that crosses all standards and will be done many times throughout the year. 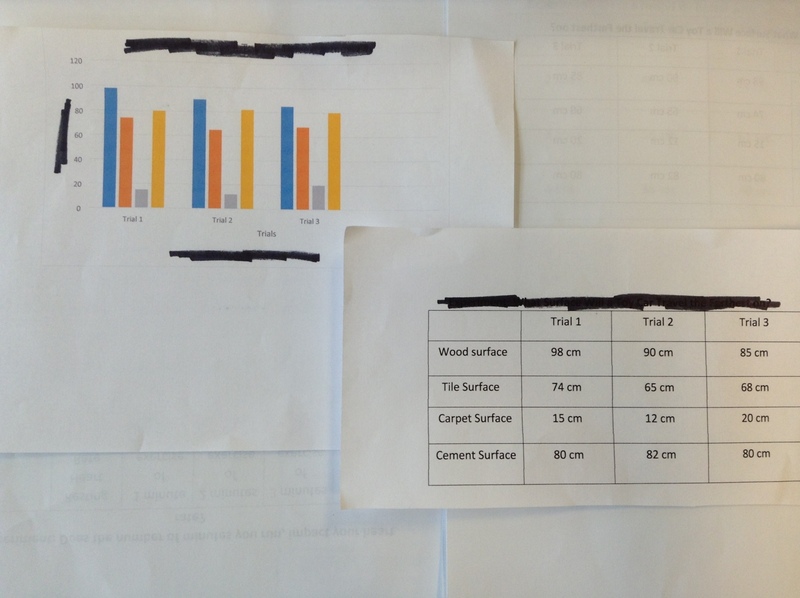 As students complete experiments, they will be required to illustrate their data in a graph to share with others. Graphing connects math and science by drawing some of the math practices into the science curriculum. Graphing requires students to think abstractly and quantitatively (MP.2). It also requires them to model with mathematics (MP.4). The goal of this lesson is for students to understand the components of a good graph (title, headings, selecting an accurate interval for data, and a key) and be able to create a graph with all components. Students will also be practicing reading graphs and aligning it with data given. While this is not the overall goal, it is also an important skill. Students will demonstrate mastery of this by creating a graph from the data they collected in the previous lesson. They will be scored on the creating graph rubric and reteaching will take place based on weaknesses observed. 1 Copy of the data and graph matching game for each group, with the title and axis headings blacked out on the graphs. The graphs and data charts need cut apart and placed in the correct envelopes. 1 copy of the graphs from the data and graph matching game with nothing blacked out, leave these out to use on the overhead. I begin today’s lesson by passing out an envelope titled “Data” and an envelope titled “Graphs” to each group. The data and graphs have been copied from the data and graph matching game. The graphs that are in the envelope, have the title and the axis headings blacked out. Once each group has their envelopes, I tell them they will be matching one data chart from the data envelope with the graph that correctly illustrates that data from the graph envelope. I tell students to raise their hands when they believe they have all matched correctly and I will come check. Students open their envelopes and begin the activity. I circulate to listen to conversations going on during the activity. When hands begin going up, I circulate to check if they matched them all correctly, if not, I point out which ones are not correct and ask them to fix them. When groups are all finished, we discuss how the groups completed this task. I ask what information helped them match the data to the graph and if there was anything that may have confused them. I then show the graphs on the overhead with the title and headings visible and ask students if this information would have helped them match them more quickly and why. 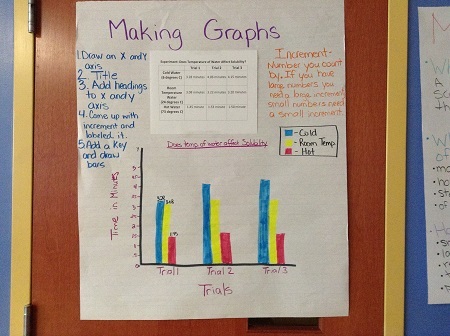 All students comment on the title on the graph matching the data chart. I explain that these labels are important to include on all graphs to help make reading it easier for the viewer. I also point out the numbers on the X or Y axis and ask them what they notice about these numbers. Students tell me, the numbers count by the same thing each time, they don’t go a lot higher than the highest measurement, etc. I tell them that the number it counts by is called the interval and it is important to choose an interval that fits with the data. If I have small numbers as my data, my interval will be small. If I have large numbers I am working with then I will need larger intervals. I ask students to look at all of the bar graphs and compare them to the line graphs from the warm up activity. I ask them why they would use a line graph instead of a bar graph. I give them a few minutes to turn and talk with their group. I circulate to listen to conversations. I am listening to hear groups discuss that line graphs are measuring over time, and bar graphs are comparing. After a couple of minutes, I call on a group I heard having a really good conversation about the difference to share with the rest of the class. If you don’t hear any groups talking about the differences correctly, you can say “I heard one group say…” and just tell them the correct answer making them think you heard a group say it. I explain that in science both graphs are used, but the majority of the time we will be creating bar graphs. I tell students that today we will be focusing on bar graphs, and we will take the time to do a line graph together, the first time we use a line graph. I ask students to put all graphs and data charts back in the correct envelopes. I collect envelopes and pass out a data chart for creating graph practice to each student and ask them to glue it in on the next blank page in their science notebook. I already have this printed and cut for students to save time. I have a larger version, data chart for anchor chart, that I have glued to an anchor chart on the front board. I will be creating my graph on the anchor chart while students create it in their notebooks. I tell students both line graphs and bar graphs begin the same, with an X and Y axis. I draw a large X and Y axis on the anchor chart and students do the same in their notebooks. I begin a list of steps to creating a graph at the bottom left corner of my anchor chart using a different color marker. Step 1 is draw an X and Y axis. I ask students what the title of our graph should be and they say “Temperature of Water and Solubility”. I record this on the anchor chart in the top center of the graph space I have drawn. I then switch markers and record the title as step 2 of the steps to create a graph. I tell students to look at their data table and decide what the two axis headings will be. I give them a few seconds to turn and talk with a neighbor about this. Then ask them for ideas. They are able to tell me the trials but mistakenly say the other heading would be the temperature of the water. I move off my anchor chart to the white board and draw this out. I ask them what my bars would be. They notice the mistake and say that the y axis should be the time it takes to dissolve and the bars will be the temperature of water. I move back to the anchor chart, and label the x axis “trial 1, trail 2, and trial 3” and label the y axis “time to dissolve in minutes. I then record this as step 3 of the creating a graph section. I ask students what the lowest data measurement is (1.45 minutes) and what the highest measurement is (4.15 minutes). I tell students the numbers on my y axis must go from 0 to a little higher than 4.15 and ask for some ideas on a good increment would be. This allows me to check for understanding on how to select an appropriate increment as well as correct any misconceptions. Students tell me to count by ones. I show them that counting by ones would only take me up five lines, leaving a lot of empty space. I ask for other ideas, looking for students to tell me to count by .5 because I have decimals in all my numbers and my numbers are all low. After getting this answer, I label my y axis with these measurements, and record step 4 of my creating graph section with select an interval for your measurement data. We then create a key showing that each temperature will be represented by a different color. I label step 5 of the creating a graph section with identify independent variables in a key. We use the key to create the bars that illustrate the data. I do trial one with them to model, then ask them to work with their group to complete trials two and three. As they work, I add step 6 to the creating graphs section of the anchor chart and write draw bars to illustrate data. For a better view of the details on the anchor chart see the Up close photo of anchor chart. After completing the graph above, students use the data they collected for the drops of water on a quarter experiment we conducted yesterday to create a graph. I tell them to open their foldable from the experiment, and under the heading, Graph, to draw the X and Y axis for their graph and begin graphing. I did not provide students with graph paper to do this but you certainly could. The space on the foldables is relatively small so you could cut a piece of graph paper into several small rectangles, and provide students a piece that you feel would benefit from having it to help organize their illustration. I circulate to check for understanding that this should be a triple bar graph with all of the bars for trial one together, the bars for trial two together, and the bars for trial three together. I check to ensure that students are selecting an appropriate increment for the data and have included the title, headings, and a key. As students are finishing, I begin marking their creating graph rubric with any areas of weakness I observe. We use a standards based report card so points are not associated with the rubric but the rubric can easily be adjusted to include points. Students work at different paces and thus finish the graph at different times. When some of the faster students finish up their graph, I call them over to the small group table where I have 5 laptops set up. I have them bring their science notebooks with them. Creating graphs will become homework following experiments we conduct in class mainly because of the amount of time we have for science. When it is assigned for homework, I give students the option of drawing the graph, or using a computer program to create the graph. I use the time waiting for others to finish, to walk these students through the steps of how to create a graph in Microsoft Word. We use the data they have in their notebooks from the quarter experiment and create a bar graph using this program. After about ten minutes of drawing their graphs in their notebooks, I choose a couple of graphs to show on the overhead as good examples of what the graphs should look like. Everyone has different data so they won’t look exactly like the samples shown, but should be close.